Son of Frankenstein, with Bela Lugosi in the surprising role of Ygor, opened in January 1939 to great success. Movie horror returned, and Lugosi’s long drought in acting work ended. He appeared in three more movies in 1939 and one 12-part serial. His roles for once had some variety: a mad doctor in The Phantom Creeps (serial), a criminal mastermind in Dark Eyes of London, a sinister butler in The Gorilla, and a Russian commissar in Ninotchka. Stereotyping still held him in its grip; but Ygor at least broadened his repertoire to include a few ominous servants. Memories of the three years of near-total unemployment, with the loss of his home, never left Lugosi. In interviews, he harps on the horrors of insecurity and the fear of not providing for his family. Does the public want more of “The” Horror Boys,’ as they are affectionately called? A recent survey showed that audiences, particularly young audiences, arc clamoring for them. Before starting “The Son of Frankenstein,” Universal decided to reissue some of the old thrillers to check up on audience reactions. Neighborhood theatres showed a triple bill that week, “Fran kenstein,” “The Vampire,” and “The Bride of Frankenstein.” to capacity houses. This thoroughly satisfied them that if the public will go crazy over the “Horror Boys” in three different films, they will certainly pay their pennies to the box-office for the colossal spectacle of the boys together in one film. It was Bela Lugosi, Hungarian actor, who gave me a few facts of the filming of the latest hair-raiser. Mr. Lugosi looked properly repulsive going through all his scenes with his head on one side. NO HORROR STUFF FOR LUGOSI, JR.
His name in Bela Lugosi—but he’ll never be a movie “horror man” if his famous Dad has anything to say about it. “Acting is too hazardous a career. The income is uncertain, and it is one field in which very few succeed. I would prefer to see Bela, Jr. in chemistry or electrical engineering,” explained Lugosi. If Bela Lugosi has any say in the matter, his son and only child, Bela, Jr., won’t follow in his father’s footsteps. On the set of The Gorilla at 20th Century-Fox, the horror man of the movies told director Allan Dwan and the Ritz Brothers that he is going to start early to divert any inclinations in the youngster to emulate his famed daddy. 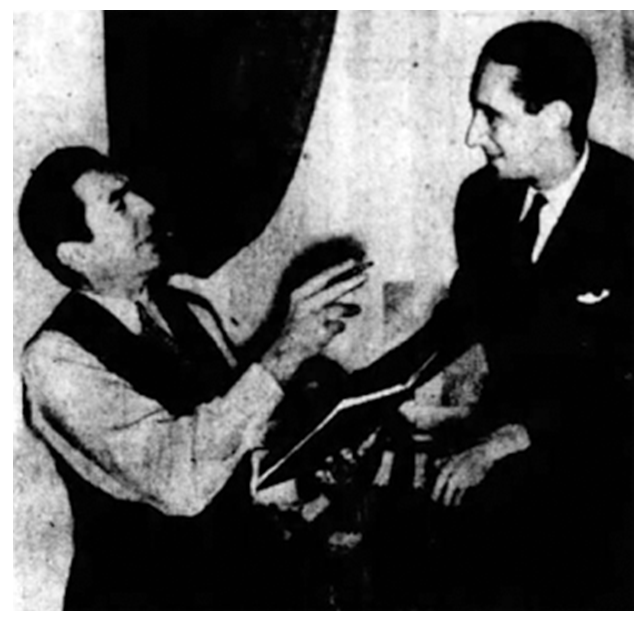 “I intend to interest him in more stable fields than acting,” said Lugosi. “It is too hazardous a career, an income uncertain, and it is one field in which very few succeed. For Bela, Jr., I would prefer chemistry or electrical engineering. Hollywood – Bela Lugosi waited two years for the telephone to ring, but when it did the noted Hungarian actor felt that he had hit the movie jackpot. On the set of the 20th Century-Fox picture, The Gorilla, the horror man of the movies looked back on the two-year Lugosi “drought” and sighed his thanks that it was over. “For 24 months I did not get a single call from the studios,” he said. “Not withstanding the whims of Hollywood and caught unprepared, I was hit doubly hard. “It was then that I first learned what Hollywood means when it says a person is ‘on the wrong side of the fence.’ Mind you, no personal reasons were attached. It was simply that I suddenly found myself a type not in demand. But Hollywood relented as it always does in the case of actors with real talent. But it was two years between telephone calls for Lugosi. The party on the other end of the telephone was a casting director at Universal studios who asked if Lugosi was available for a role inSon of Frankenstein. Available! Lugosi was willing to be at work in 10 minutes. The success of the horror picture re-established Lugosi in the minds of casting directors and Universal signed him to a three-year contract. He also was signed to a separate contract to appear with the Ritz Brothers in The Gorilla. And to top it all off, Lugosi is making 37 transcriptions for a radio mystery serial in which he is starred. He also is considering a deal to go to England and make a picture for British International pictures. Is it any wonder that Lugosi sits around the set humming snatches of songs and grinning happily at everyone? GARDNER: Except for s slight difference. GARDNER: About $260,000 a year and five daughters. GARDNER: Fine thing. You worried about getting nervous … And after the shivers you’ve give 130,000,000 Americans, too. Tell me, if you don’t mind my asking the questions, when you were a little boy were you afraid to sleep alone in the dark? LUGOSI: That’s the first time anybody ever asked me that question. I never had a chance to be scared when I went to sleep because I came from a poor Hungarian family and there were too many of us in the house to be alone or to be frightened. BUT I found out that I was afraid to be alone when I first went to Hollywood. GARDNER: In other words, you didn’t agree with Greta Garbo’s policy of being alone? LUGOSI: I don’t know about Greta, but I do know that I moved into a very large house all by myself and thought I have a couple working for me they lived in a different wing of the home. And when I went to bed at night I never could fall asleep — It was so dreary and never-wracking. I’d read and read and read until the coming of the dawn. That seemed a little friendlier. GARDNER: Well, when did you finally get over it? LUGOSI: I got over it when I married my first wife. LUGOSI: I’ve been married four times. GARDNER: Don’t tell me that Tommy Manville’s been making those Dracula pictures! LUGOSI: No, the name is still Lugosi. I got married the first time because I was lonesome and I needed companionship and I got it for two years. GARDNER: What about your second wife? LUGOSI: I was married to her for 14 days, and before you go any further let me tell you that that was a long time compared to the duration of my third marriage. GARDNER: Well, how long — or how short a time did that last? GARDNER: In other words, you’ll almost be a Broadway columnist as long as you were married to your third wife. Would you call her a guest wife? LUGOSI: I don’t know what you’d call her, but I think that marriage is like everything else. It’s a matter of a good break, and I finally found a woman six years ago who is a mother, a goddess, a watchdog, a secretary and a wife all combined. She was Lillian Arch before she became Mrs. Lugosi, and we’re now on our seventh year together. GARDNER: That would seem to indicate that “4” is par on your matrimonial course, huh? LUGOSI: “Pa” is right … I became a daddy 14 months ago and I’ve never been happier. GARDNER: I understand that Boris Karloff had a baby girl about the same time. LUGOSI: Yes, he did. We often get together and talk about when our children grow up and how nice it would be if they fell in love with each other. GARDNER: That would be a fine romance … The son and daughter of two bogey men. LUGOSI: Talking about my son — If you saw the picture “Son of Frankenstein” you will remember I was Igor, the fellow who was hung for murder but who lived with a broken neck. The part was difficult and I had to keep my neck and shoulder in a vice for so long that for six weeks after the picture was finished I still walked around with my head and shoulders bent to the left. Lillian made me stay away from our little boy for a while because he began walking round-shouldered too — she thought he might think that was the proper way to walk. GARDNER: What do most people say to you when they meet you? LUGOSI: Most people are very nice and I think that just as many of them that say “hello” also say “Come now, Bela, scare us.” Nevertheless, they look upon my parts of Dracula and Igor just as characters and don’t confuse it with my own personality. GARDNER: What clubs do you visit when you are in New York? LUGOSI: I don’t go to clubs very often. 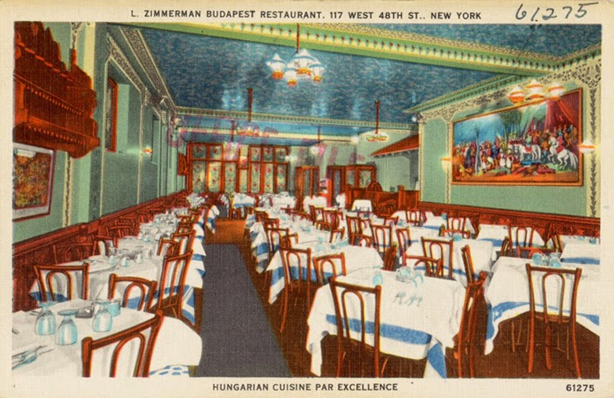 My favorite place is Zimmerman’s Budapest … I love to sit and eat Hungarian food and I could listen to Hungarian music all night. GARDNER: Can you play any instrument? GARDNER: Do you think you’ll ever get a chance to play the piano in a picture? LUGOSI: I don’t know. That’s up to Universal. I just signed a contract to make eight pictures for them and they promised they won’t all be children scarers. GARDNER: I understand you’re going to England. What are you doing there? LUGOSI: I’m just going there for a trip — to make a picture out of Edgar Wallace’s story, “The Dark Eyes of London” … I should be back here on April 21. GARDNER: You came from Hungary. Are you a citizen of the United States. LUGOSI: Yes, thank God … I’ve lived here for 20 years and I have been a citizen for 10 years. I hope I am a good one. I know I don’t take it for granted. I feel I am an awfully lucky person to be an American and I think that every naturalized American and every person born in this land should kneel on his knees every morning and utter a prayer for being an American. Hollywood—It’s a little snow-white bungalow with baby-blue window shutters and you’d expect Shirley Temple to live there. You know who does live there? Bela Lugosi. Bela, the bogeyman, and Mrs. Bela, his young American wife, and Bela, Jr., who is 18 months old now. A delicious suggestion of an aroma insinuates itself from the atmosphere from the kitchen. There’s a Hungarian cook in there, and what a cook! Bela is just up—he reads until 4 a.m. daily and is having his unghoulish breakfast of cantaloupe, pears, peaches, gooseberries, milk—but our lunch is a dream of fragrance and delight. Stuffed cabbage, ah-h-! A meal in itself, and such a meal! Then coffee, and a dessert—palacsinta. That’s Hungarian pan-cake, folded over guava and papaya jelly. Then talk. Movie villains, especially the horror men are charming people. That goes for Karloff, for Peter Lorre, for Lugosi. They do not always tend their flowers personally, but almost invariable they love their children and dogs. The living room is not elaborate. The house is small, not like the mansion the Lugosis had once upon a time. The furniture is heavy, leathered-upholstered. The enormous grand piano fills one-third of the room. Bela has just done what every actor wants to do. He has worked with Garbo. A small role in Ninotchka. Small, but important to him. This, he says, may be the role that will restore him to his lost past. He shares the scenes alone with Garbo. He plays a straight character, not a bogey-man. Producers, directors will see the Garbo picture because they will see Garbo. Lugosi hopes also they will see Lugosi, playing straight. His is not a new story in Hollywood. For 20 years he was on the Hungarian stage, went to New York a success. Because he played there the horror role of Dracula and was brought to Hollywood to make the picture, he became “Dracula” to movie-makers. This was well—he had a mansion then—until the censors clamped down on horror pictures. “For two years,” he says, “I did not work. I stay by the telephone. I hypnotized it by sitting looking at it, waiting for a call. None came. I lost my home, my car, my furniture, almost everything. I borrowed money to live. I almost went crazy. Then a little theater in town tried an experiment. A full fill of horror films. Frankensteinand Dracula together. Lines waited outside to get in, night after night. The horror vogue swept the country. Universal promptly called Karloff and Lugosi for The Son of Frankenstein. 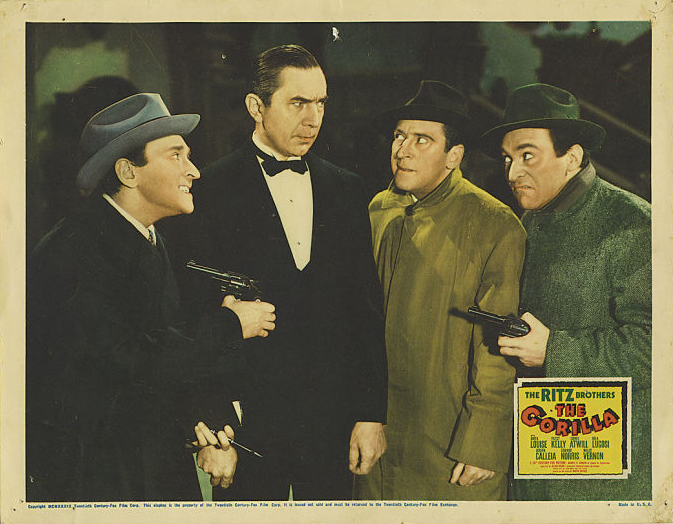 Lugosi small role was expanded as the film developed, expanded to equal Karloff’s. After that, Lugosi had “come back,” was in demand again. Today, thanks to that picture, to The Shadow Creeps, to Ninotchka and others, Lugosi has reclaimed his car, his furniture, paid all his debts. Note: Lugosi’s quotes in the original interview reproduce his accent and pronounciation. Thus, the first quote below, “It was nothing but coincidence” is printed as “It was nottink but go-inzidentz.” That’s rather distracting. The transcription below captures what Lugosi said, and not the way he said it. Proceeding with his Dracula tale, the Hungarian mummer recalled that he was picked for the part because he played some character roles in evening clothes and was expressed to cut an impressive figure in soup-&-fish with bat wings attached. He played the Evil Monster for a year in New York, but when the company took to the road he left it to try his luck on the Pacific coast. There—at the Biltmore Theatre in Los Angeles—he continued to impersonate the creepy Count—fluttering through the dank night air, drinking blood of fair young maidens and finally dying with a stake through his heart. And that is how Mr. Lugosi came to play Dracula on the screen. His luck, however, was short-lived. 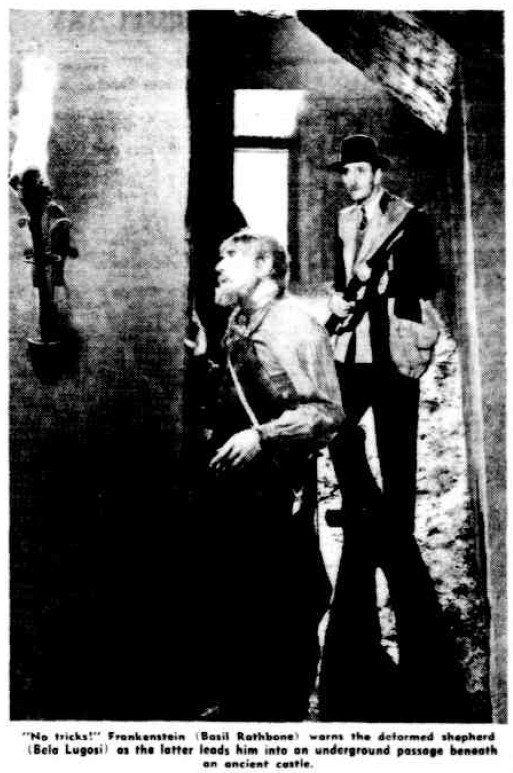 Soon after the release of the film, Great Britain banned all horror pictures and Hollywood which derived nearly 40% of its gross take from British sales, stopped making shockers. Mr. Lugosi who, of course, was definitely typed by this time, was out of work for two full years. It was when the movie manufacturers, encouraged by successful revivals of the Dracula film in this country, resumed the horror racket for the domestic trade that our hero was cast for Son of Frankenstein. After that he made Dark Eyes of London, The Gorilla and The Shadow Creeps. His latest job was a straight job in Greta Garbo’s Ninotchka—his first straight role in 13 years. When he was a child in Transylvania, said Mr. Lugosi, he was like all youngsters in that region, frightened out of his wits by peasant maids and nurses who talked by the hour of vampires, evil spirits and the undead -those hapless mortals who only seem to die but don’t pass away until a stake is driven through their hearts. “Never did I go down in our cellar which was full of wild bats,” Mr. Lugosi recalled, “Mean little bats, so small as sparrows, but when they fly in your hair, you must die. There were also great big bats flying around at dusk, and the peasant women put their shawls on their heads for protection. As a schoolboy, the actor said, he developed into a hero among the lads of Lugos, his home town. There were two schools – Hungarian and Romanian – and the pupils of the two institutions waged bloody battles. “I was the commanders of the Hungarians,” said Lugosi. “I was a hat hunter. Like the Indians used to collect the scalps of their enemies, so I collected the hats of the Romanian boys. In two years I got 1,500! I put them up for sale and made a lot of money. 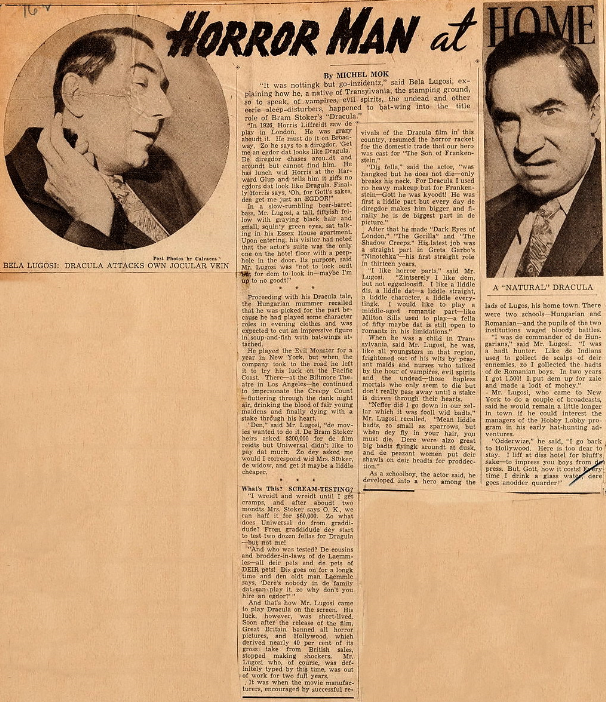 Mr. Lugosi, who came to New York to do a couple of broadcasts, said he would remain a little longer in town if he could interest the managers of the Hobby Lobby program in his early hat-hunting adventures.